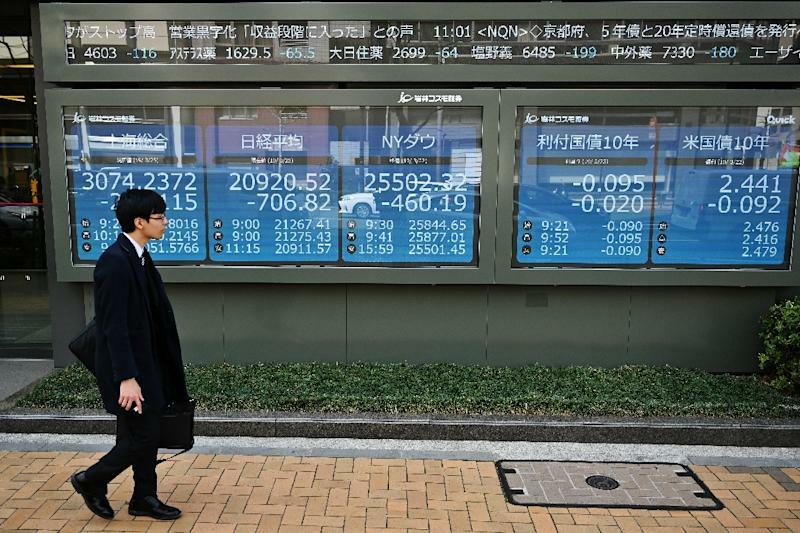 "The Tokyo market sharply reacted to the yield curve inversion, which is a symbolic sign of slowdown," said Daiwa Securities senior technical analyst Hikaru Sato. The yield curve, which tracks the spread between short- and long-term rates on US Treasury bonds, briefly inverted on Friday, with yields on 10-year bonds falling below those for three-month notes -- the first time this had happened since before the global financial crisis in 2007. There was no panic selling "but sizable sell-offs were seen in the morning", Sato told AFP. "We are closely watching whether US shares will continue to fall at the start of this week," he said. The Japanese market was also weighed down by weakness in exports to China, Tsuyoshi Nomaguchi, strategist at Daiwa Securities, said in a commentary. Investors are awaiting a series of data this week, including US housing starts for February on Tuesday and Japan's factory output for February due on Friday, he added. The dollar fetched 109.94 yen in Tokyo afternoon trade, against 109.93 yen in New York on Friday. In Tokyo, blue-chip exporters were lower across the board, with Toyota falling 2.11 percent to 6,610 yen and Honda down 2.99 percent at 2,962.5 yen. China-related shares were sharply lower as construction machine maker Komatsu lost 4.14 percent to 2,554.5 yen with industrial robot firm Fanuc down 3.83 percent at 18,800 yen. Lenders were also lower with Mitsubishi UFJ Financial falling 2.94 percent to 553.4 yen and Sumitomo Mitsui Financial down 2.49 percent at 3,915 yen.